План-конспект: The story of the foolish man and the wise man (who built a house on sand and rock). Sinful people will be punished. 1. Hello, where are you going with that wood? 2. I'm going to build me a house. 1. Where will you put it? 2. Right over there on that high ground. 1. Say, I want to tell you a story. It is from God's Book. Jesus told it. There was a wise man and a foolish man. The wise man wanted to build a house. He said, "My house must be strong. It must last a long time. I will build it upon high firm ground." (Use "rock" in each instance, if appropriate). (Pause 3 sec.) When he finished it he said, "It is good." Soon the rains came. The winds blew and blew. The floods rose. (Pause 3 sec.) But the house was strong. It did not fall down. His house was built on high ground. 2. What about the foolish man? 1. (Laughing) He built himself a house, too. But he built it on the sand! (Pause 3 sec.) When it was finished he said, "This is a good house." Soon the rains came down strong - whoosh! (Use local expression) (Pause 3 sec.) The river overflowed its banks. The water kept eating away and eating away under the house and it fell down. (Pause) (CRASH!!) Just like that! He cried, "Oh, oh, oh! My house is gone. The river has carried it away." (Use voice off mike) Yes, his house fell down because it was built upon the sand. 2. He was indeed a foolish man! 1. Yes, and Jesus said that many are foolish like that man, because they do not obey God. Jesus said, "Those who believe My words and practice them are like the wise man who built his house upon a rock. Whosoever hears My words and believes in Me shall never go to the place of fire and pain after death, but shall have safety." The foolish man who built his house on the sand is like the person who listens to Jesus' words but doesn't obey them. Jesus wants us to be like the wise man. Then we will not be punished when the time comes for God to judge people. Those who trust Jesus and obey His words will not go to the place of fire when they die. 1. And Jesus says that people are like these houses. 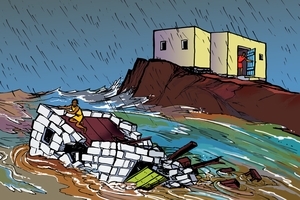 Both the houses received the storm and floods. Likewise, one day God will test our lives. Those whose lives are sinful will be like the man whose house was destroyed. They have not built their lives on the right foundation. They will have great punishment after death. 2. But God knows all OUR sins. Then surely we will all have this punishment. 1. That is true. But the house on the high, firm ground (rock) was not in danger. Even so, the one who takes the words of Jesus with a true heart, and trusts Him, is not in danger. Jesus Christ takes care of him. My friend, Jesus loves you. That is why He suffered punishment for your sins on the cross. In this way, He paid your debt. If you believe in Jesus and obey His words, you will not go to the place of punishment. Jesus said, "Those who receive My words and believe in Me, are like the wise man who built his house upon the high, firm ground (rock)." 2. Your words are beautiful. I do not want to be a foolish man. I want to be like the wise man. I want to put my trust in Jesus, the true Saviour. I will build my life upon His words. Sound effects: Building, storm, building, storm, crash. GRN has recorded a version of this script in 640 languages and dialects. See full list.